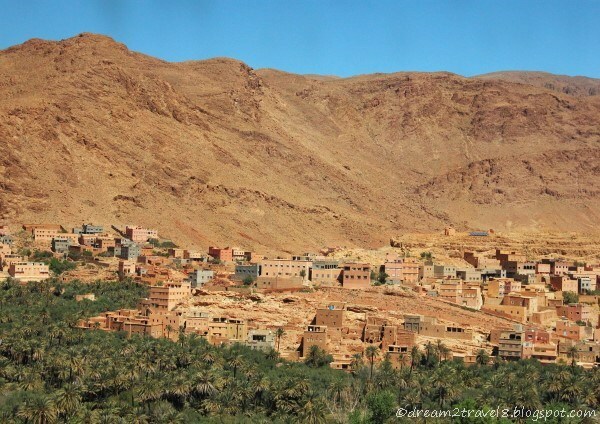 It was at the midpoint of our week-long Morocco tour where travel fatigue was supposed to be setting in, however, this was the day that my husband and I looked forward to the most. 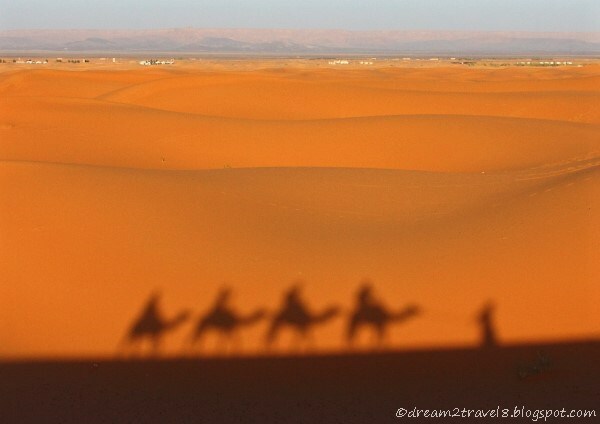 You might be wondering what was so special about this day...well, this was the day when we finally head to the Sahara desert!! I have heard about Sahara desert since I was a child and the closest that I could get to it was through television programs and movies. It felt like a dream that we are actually going to step foot on the place which I had yearned to visit for the longest time possible! With hyped up spirits, we were filled with much anticipation for the places that we will be visiting for this day! My husband and I did not even need to rely on the hotel morning call as we woke up earlier than the scheduled time! When we arrived at the hotel restaurant to have our breakfast, we were surprised to find most of our tour mates already there and everyone seemed to be in an unusually happy mood! It was certainly a great start to the day! After the sumptuous breakfast which fueled our bodies with energy for the day, we boarded our van. As we headed off on our journey for the day, the endless chatters continued on and everyone became even more excited when our guide showed us how to tie our shesh or scarves into a Tuareg turban in preparation for our trip to the desert. It was necessary to cover most of our faces to prevent inhalation of the fine desert sand. The chattering got even louder when majority of us expressed our disappointment that we did not bring along a suitable scarf or manage to purchase the shesh beforehand. We only calmed down after our guide mentioned that we would be able to purchase the shesh at the rest stops along the way. 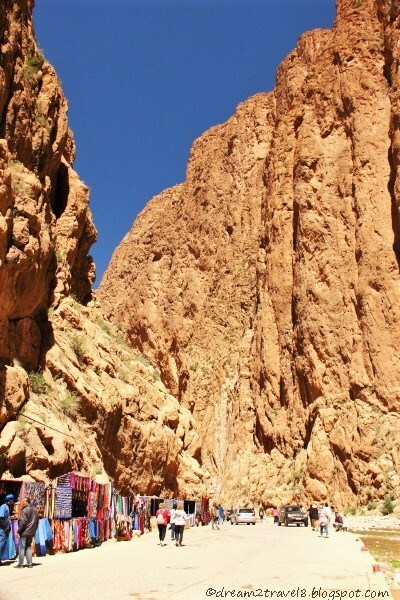 With assurance that everything is well on track, everyone started to settle back into their seats as we traveled to the first destination of the day - Todgha Gorge, a series of limestone river canyons located in the eastern part of the High Atlas mountains. When we arrived at the gorge, we were simply in awe by how magnificent the place was! With towering canyon walls closing in to a mere 10 meters from each other and a small glacier stream located at the bottom of the gorge, it was an unforgettable sight! While walking through this breathtaking gorge, I cannot help but felt insignificant when compared to these gigantic landscapes of Mother Nature. 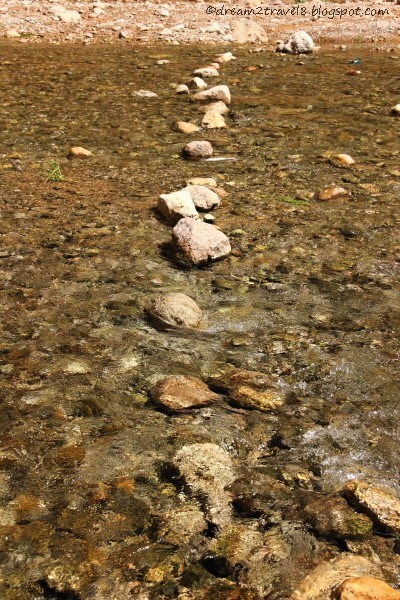 My mind seemed cleared of all thoughts as I walked along the river stream, taking in the beauty of this place to my best ability. The calm and serene aura of this place certainly has a therapeutic power to calm one’s mind! 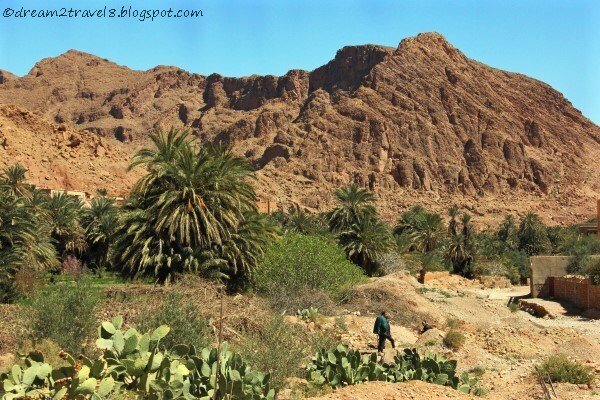 We were left to wander about the Todgha Gorge for a good one hour before we had to set off for our next destination. With unwillingly hearts, we boarded the van and took to the roads. We made several rest stops along the way (including one for lunch) and as promised by our guide, all of us managed to purchase the shesh for use later at the desert at one of the rest stop. 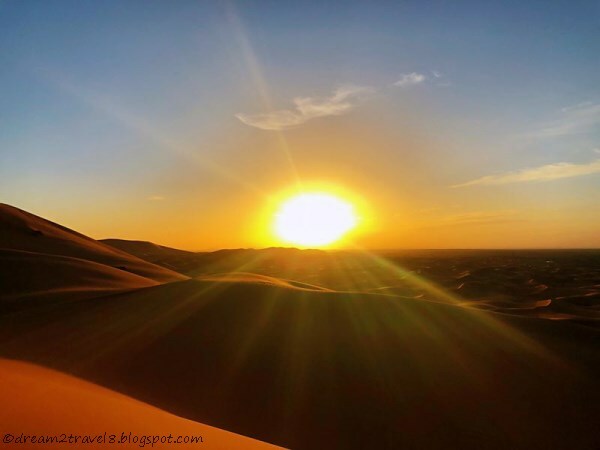 After travelling for quite some time and losing ourselves in the mesmerizing view along the way, we arrived at our hotel in Merzouga in the late afternoon. We were given time for a short rest in our hotel rooms as the scorching sun made it a bad timing to head to the desert. As it slowly approached 4.30pm, our guide gathered all of us at the hotel lobby where we then took the 4 by 4 jeep out into the desert. 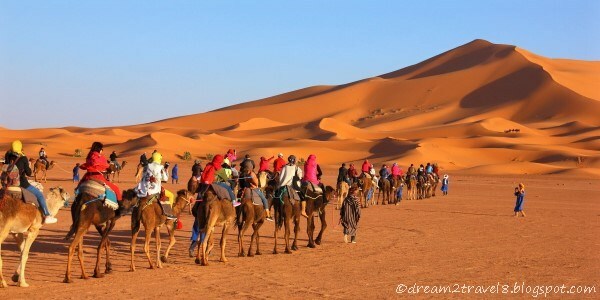 It was quite an interesting sight as everyone had their Tuareg turban on and we looked like a group of desert wanderers! Riding the camels to the sand dunes..
A bumpy half an hour drive took us to the place that we so desperately wanted to visit and it was just such an amazing feeling when we came face to face with the magnificent Sahara desert! The gorgeous sand dunes that seemed to roll into eternity was just so awe-inspiring that it even had the effect of making the noisy chattering in the jeep come to a standstill! Everyone was literally dumbfounded by its beauty! When we alighted from the jeep a short distance from the sand dunes, we were greeted by rows and rows of camels tied together by a rope in groups of four. Slowly, one by one, we got onto the camel and shouts of horror by the rider seated on the camel’s back could be heard in synchronised manner when the camel stood up from its seated position. When it was my turn to get onto the camel, I finally understood how horrifying it was when the camel stood up. It was literally like a roller-coaster on the camel’s back as I was tossed back and forth as it rose to its standing height. Still in shock by the brief moment of roller-coaster ride, I struggled to maintain my balance as the camel pressed forward in its trek towards the sand dunes of Sahara desert. 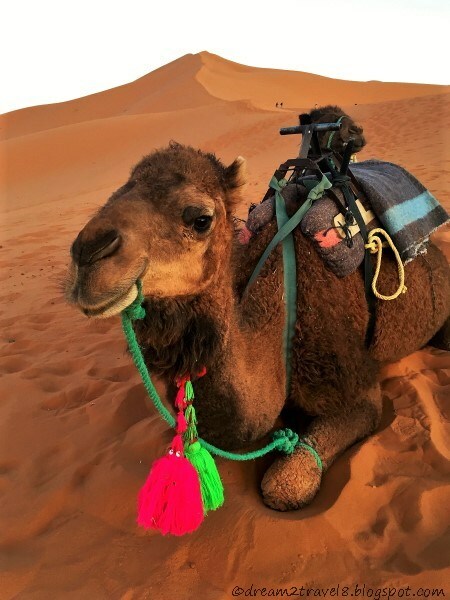 When I finally found my balance and gotten used to the rhythmic motion of the camel, it then dawned on me that I am actually riding a camel into Sahara desert - an item that was going to be ticked off my bucket list!! I could hardly contain my excitement and was just soaking in all that the desert was offering to us! It was an experience beyond words and as I looked back towards my husband (who was riding on the camel behind mine), I could tell that he was enjoying this moment as much as I did! The visit to Sahara desert was definitely the highlight of this trip and an experience that will be forever etched in our memories! With a slow and steady pace, the camel brought us closer and closer to the sand dunes and I was busy making mental photographs of this beautiful places (and of course some real photos as well!). Surrounded by nothing by the fine sands of the desert, I seemed to be able to locate my inner peace quite easily and with a mind cleared of the influx of random thoughts from the trip to Todgha Gorge, this day has been the most relaxing and peaceful one thus far! 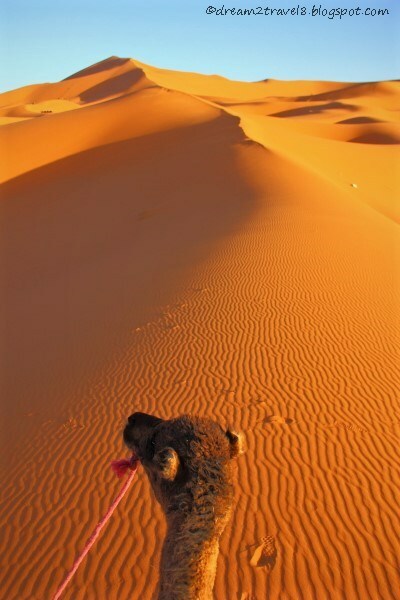 When we reached the peak of the sand dunes, we alighted from the camels and the camel guide (the person pulling our row of camels) gestured to us to follow him. While walking through the camels’ rest area, we managed to catch a closer glimpse at these lovely animals who had worked hard to bring us to up the sand dunes and I cannot help but whispered “thank you” to them! Trekking further up the sand dunes, the camel guide lay down a carpet on the fine sands and indicated to us that this is where we will sit to admire the sunset. As there was still time before sunset, the camel guide started to guide my husband and I to take a series of jump shots on the sand dunes. It was such a fun and lovely feeling to jump and land on the soft sand! I could hear my other tour mates having fun running and jumping about on the sand as well. A few of them were even shouting at the top of their lungs as their camel guide pulled them down the slopes of the sand dunes on the makeshift carpet sand sled! Having had enough fun playing about on the sand, my husband and I settled down and sat on the carpet provided to admire the sunset. Watching the sunset together with my husband has always been something that I wanted to do and I was glad that we had the chance to do so on this trip! It was a heartwarming feeling as I leaned on my husband’s shoulders and quietly watched as the sun which illuminated the sand into this golden color slowly creep its way down below the horizon! It was indeed a good ending to this fun-filled day! The sky soon started to turn dark as we made our way back to our camels which then brought us through a slow and quiet journey back to the jeep pickup point. By the time we reached the jeep, the sky was completely dark and I must say that I was quite impressed by our jeep driver who seemed to have a way to navigate the direction in complete darkness! While chattering with our tour mates on the journey back to the hotel, our driver suddenly pulled over at a random spot and gestured to us to head out and look up into the sky. Heading his advice, we looked up and saw a clear sky decorated with countless stars that looked like precious jewels! It was indeed a very rare and spectacular sight for city dwellers like my husband and I! This was not part of the itinerary but it certainly added on to the joy and excitement that we had for this day! Fantastic post Claire! This is high on my bucketlist. Your pictures of the Sahara dessert and the towering canon walls are amazing. 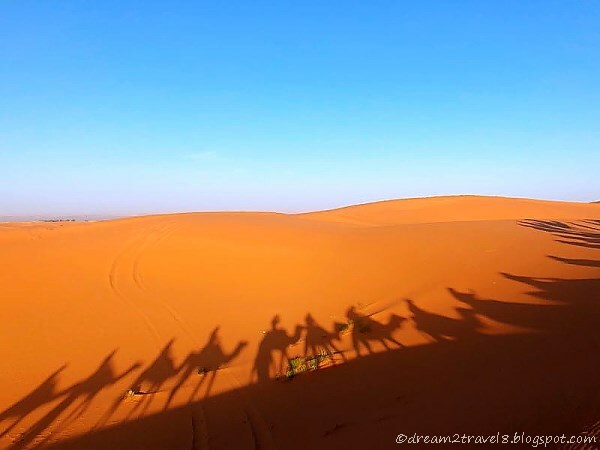 It does look like riding the camels would be a bumpy ride, would you ever do it again? This must have been one of the highlights of your tour. The Sahara desert looks so awesome with a strange wild beauty. The sand dunes are mammoth. 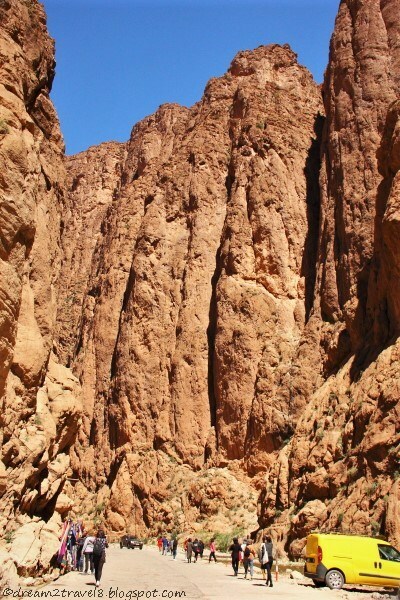 The Todgha Gorge also looks so awesome and stunning. One can only become speechless in the face of such awesome natural beauty. Even I had read about the Sahara desert in childhood. Ever since I have nursed the dream to visit it someday. The canyon walls are so huge and add drama to the landscape. I am not supportive of camel rides. I prefer walking on the sand. I am sure the sunset you saw was breathtaking. The landscape pictures you clicked are amazing. This is such a fun and authentic desert experience. The Atlas mountains are just so so stunning. Running on the dunes is so much fun. I love climbing them and then sliding down. Feel like a kid and I can see you too, felt the same. Beautiful pictures. This is so lovely and surreal. The images of the dune in perfect shape contrasting against the Blue sky. Also noticed that houses are all of the same colour in the place. Anything to do against reducing heat inflow? Also noticed there was a glacier stream on your trek in a place as arid near a desert. How does that co-exist? Hi Kartik, thanks for reading! I am not so sure about the houses as we only saw them from a distance. I am guessing that mud bricks were used to build these houses, which explains their brownish appearance. 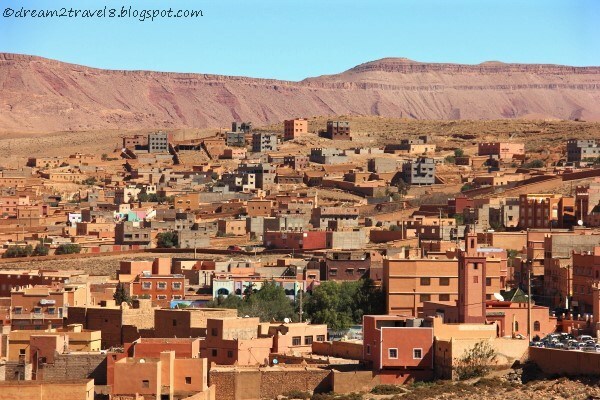 Nevertheless, the monochromatic color of the houses certainly does add an unique charm to the Moroccan Architecture! Enjoying reading your travelogue. You must have a great time jumping on the sand! Hi Amrita, thanks for stopping by!